This app allows clients/users to find the professional service providers at their home/office, whenever they need them. 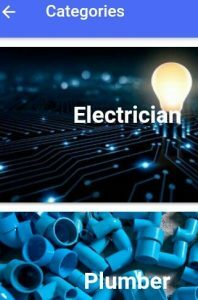 Using this app client can find professionals, contact them for services and rate professionals based on their performance. Once the application is installed, it opens the Login page. If you do not have an account then firstly register yourself by clicking Sign Up button in the login page. It will open the Register page. Fill in all the required fields and hit the Create Account button. It will open the Register Validation, and you will also receive a code through SMS on your mobile phone. In register validation page, you will be asked to enter the code that was sent to your number and click verify, if the code is correct. Your account will be activated and login page will open. 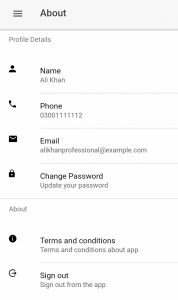 For signing in to the application, enter the username and password in the Login page and hit the Login button, if credentials are valid Home page will open , otherwise an alert box will be shown to the user. How to hire a professional? To hire a professional there is a button on the home page Get a Professional. On clicking this button a category page will open, and it will list all the categories. Each category will have a name and description. To hire the professional click the desired category and it will open the Create Job page against that category. 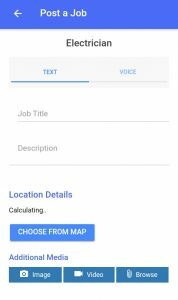 In the Create Job page, Enter the Job title and description, Select Job type i.e text and voice. User can also send the image, videos and attachments along with Job. If the Job type is voice then user can send the audio files with the Job. Once the image is selected, it will show the image in the job form and user can also delete the image. Now for creating the Job, there will be two buttons in the Create Job Screen, Hire now and Hire Later. 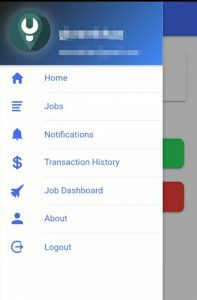 If user wants to hire the Professional immediately, click Hire Now button and new Job will be created. Hire Later For hiring Later, hit Hire Later button, A date and time prompt will open. Enter the date and time and Press the Submit button. Job will be created for the designated date and time. 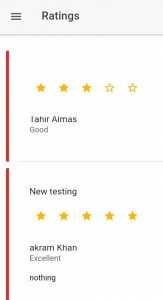 User can review all the jobs by selecting the Job menu from the sidebar. 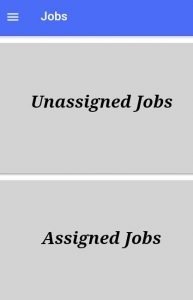 This page will show the list of all Jobs. 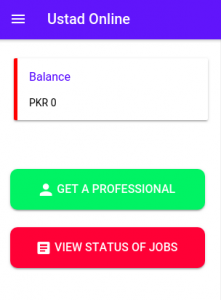 If no professional is assigned and the job status is new then user can also delete the Job by hitting the cancel button against the Job. Once the job is assigned, user cannot delete the Job. How to find the progress of job? User is notified whenever an estimation is created and if the professional wants to visit. User can also review all notifications by selecting the Notifications menu from the sidebar. It will list all the notifications in the notification page. Whenever an estimation is created, user is notified about it and user can also check the estimation by selecting the estimation notification from the notification page. 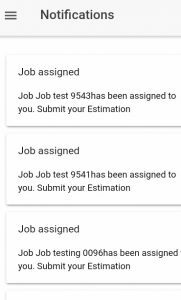 It will open the estimation so user can view all the estimation created for a particular jobs and select one estimation. Once the Job is created, user is notified when the professional visits your location. Simply Tap the notification and you can see the professional location on the map. Furthermore a calculated distance of the professional location is shown on the screen. User can also contact the professional by hitting the Call me button on the professional status page. Note: GPS must be enabled for calculating the professional distance. Active Jobs will be shown in the Job Dashboard. Current Job status and the time spent will be shown in the Job Dashboard. 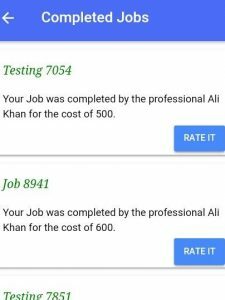 Once the job is complete, user will be asked to rate the Professional and a rate button will appear with that Job. User can rate the professional by hitting that button. By hitting that button, it will open the Rate Page. Fill in all the required fields and press the Submit button. Professional will be rated and the given feedback rating will be shown on the Job page. User can also see the transaction history by selecting the Transaction History menu from the sidebar. It will open the transaction page and all of the transactions made by user appear in that page. User can also manage his account. View or update the account details by selecting the Account menu from the sidebar. It will open the user account. 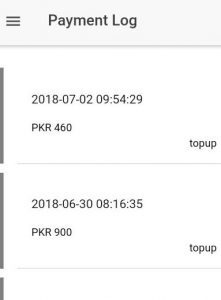 User can see his account details and can also modify those details. To logout from the app simply select the logout menu from the sidebar. A prompt will be shown to the user,click the ‘Yes’ button to sign out of app you are logged into.